When April showers strike, having a few engaging indoor activities at-the-ready is key for avoiding cries of boredom. 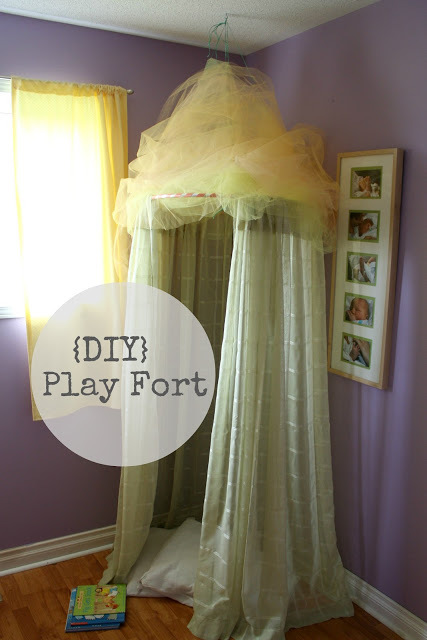 Here are five DIY hideouts you can make with sheets, duct tape, hula hoops, fans and other household items. 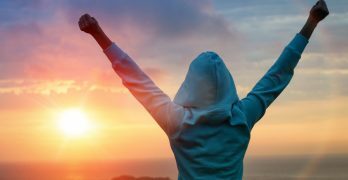 For reading, imaginative play or video gaming in, these forts are inviting support structures… no matter how old you are. This impressive pool noodle structure will up to weeks in a basement or playroom if you’ve got the space for it. Double up on the noodles to make for a super sturdy house. Make two squares with your pool noodles by taping four noodles together with duct tape (make an “X” shape where they connect). Once you have your two squares, lay one on the ground and starting connecting upward noodles to the corners. Once they’re connected, duct tape them to the top square. If you want to make a peak to the top (like a sloped roof), connect four noodles from the corners of the square structure and tape all four ends together at the top. Once your structure is in place, drape sheets over it and secure into place with tape. You can add a few extra noodles for support. This fort is like a parachute that can stay blown up by itself. It’s only got two required components and needs very little space (and effort) to set up and to clean up. Lay the duvet cover out flat on the floor and stick the fan inside the “mouth” of its opening. Make sure the duvet cover is secure around the front of your fan and doesn’t cover the entirety of the back of the fan. You might need clothespins to help keep it together. Stick books down on the bottom to keep it flat inside, if you want. 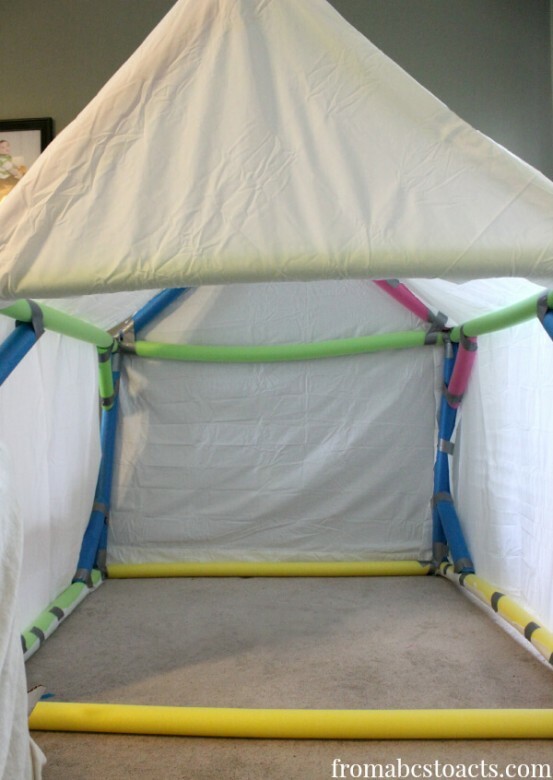 For the corner of your kid’s room, this hanging fort makes a magical little reading nook. 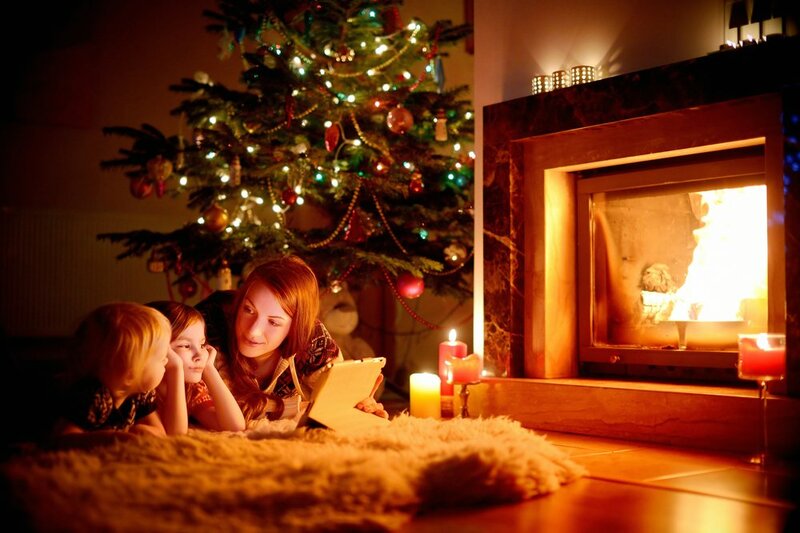 It hangs down from a hook in the ceiling, and can stay up for as long as your kid wants. Drape fairy lights from it if you want to make it super magical. Cut open the hula hoop so you can slide your curtain panels on. Once on, tape the hula hoop back together. Attach four lengths of string to the hula hoop at equal intervals tie all together with a strong knot at the end. Screw the hook into the ceiling where you want the tent to hand. Pull on it a few times to make sure it’s secured. If you want, wrap some toile or light fabric around the top to cover it. 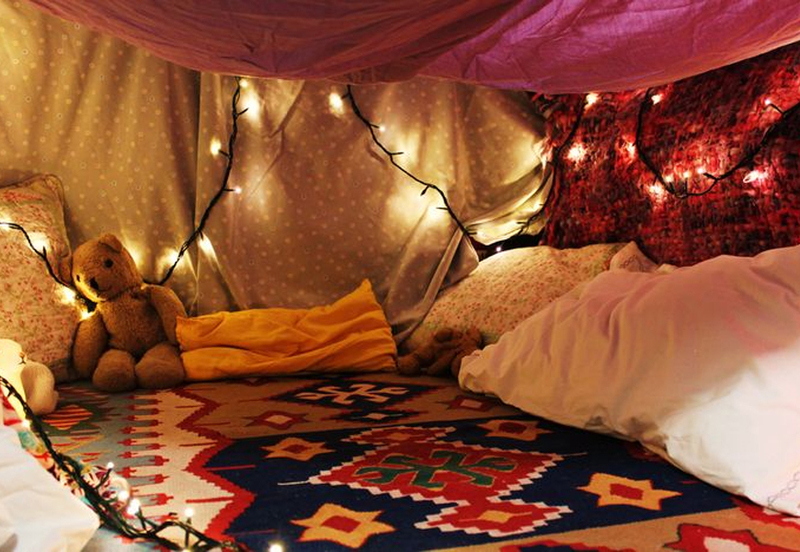 The classic blanket fort, this. Make it as big or as small as you want using different sized sheets and different heights of chairs. 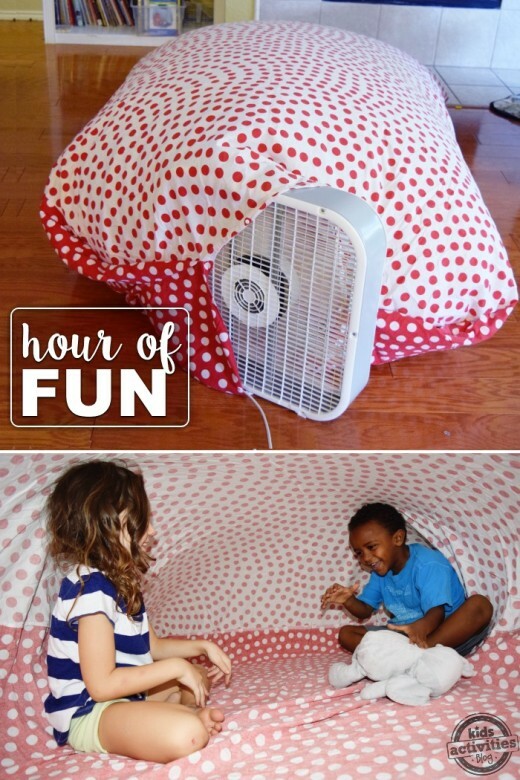 You’ll have a fort in under 10 minutes. Stretch the string from one point in the room, across to another point and nail in place (a tiny nail at the corner of a window frame will do very little damage). Move two chairs or if convenient, two couches, on either side of the string and drape the sheet over the string, to drape on either side of the couch arm rests to create a peak. Drape lights over the entrance for ambience. 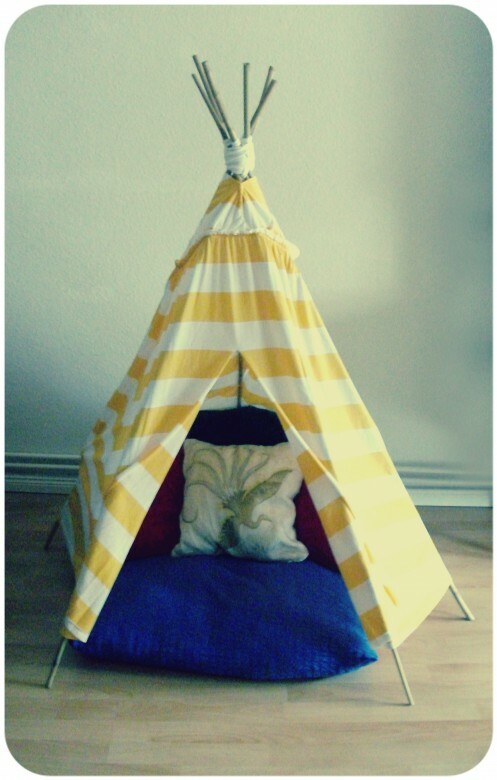 If you’ve got large maxi dress you’re ready to retire, upcycle it into this totally ingenious (and stylish) teepee. 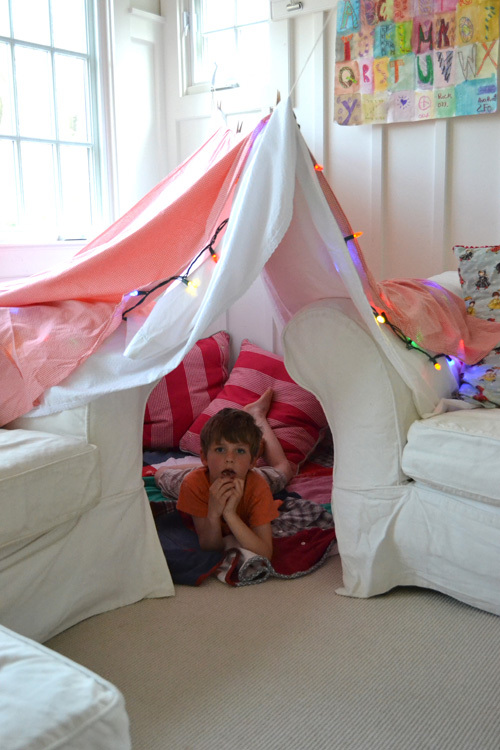 A perfect fort for one. Gather the bamboo poles together and secure with elastic(s) about 10 CM from the top. Splay the poles out evenly, standing the bunch up on the floor to make a teepee shape. Weave the string around and between the top of the poles to firmly secure them together. Drape the maxi dress over the frame and find the best “fit” (depending on the style of your dress you may have to do some snipping around the top). Once you’re happy with the drape of the dress, stick the fabric closed around the top of the poles with the needle and thread. Decide where you want the opening to be and cut a slit right up the middle, big enough for your kid to enter. 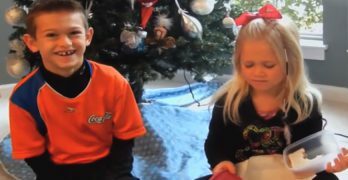 For more indoor activity ideas to keep rainy April days cabin-fever free, check out this roundup of top 5 ways to have fun inside.